Erina 02 | Custom Bathrooms | Central Coast bathroom renovations – Modern bathroom ideas. Our showroom at Erina has a diverse range of innovative and sophisticated displays that will be sure to inspire your own renovation. Combining travertine tiles with a complementing custom made wall mounted vanity, this bathroom is timeless. The frameless shower screens that are featured in this display can be easily integrated into your own bathroom renovation. 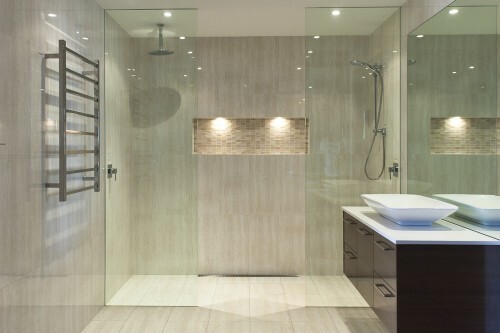 These frameless shower screens are both seamless in design and practical, as cleaning of this type of screen is quick and easy. If installed with the glass imbedded into the tile, no brackets are required.